Struggling department store chain Debenhams says it is seeking a cash injection of up to £200m from existing lenders as it tries to fend off Sports Direct's Mike Ashley. The move would allow it to turn down Mr Ashley's offer of a £150m loan as part of a deal that would put him in charge. Lenders have until Thursday next week to approve the cash call, which the firm says will allow it to restructure. It also warned that shareholders could see their investment wiped out. Shareholders reacted with dismay. The company's share price fell by nearly two-thirds to 1.1p before recovering slightly. Debenhams said the move would "provide liquidity headroom" and "deliver stability" for customers and staff. The firm - which issued three profit warnings last year - is in talks with lenders over renegotiating its debts. It is also reportedly trying to accelerate plans to close stores and is expected to close about 20 outlets this year. Sports Direct has a near-30% share in Debenhams. Last week, it confirmed it had offered a £150m loan to Debenhams as part of a deal that would make Mr Ashley chief executive. Sports Direct also wants to remove all the current members of the Debenhams board except one. Responding to Debenhams' latest move, Sports Direct reaffirmed its proposal to put Mr Ashley in control and added that it had offered to buy the retailer's Danish business, Magasin Du Nord, for £100m. Sports Direct said its plan "would provide additional management and first-class leadership to Debenhams through this challenging period of restructuring, together with additional funding". Debenhams retorted that Magasin Du Nord was a key part of the group and "a meaningful contributor to group profits". It added that there were "obvious concerns with the proposal that Mike Ashley becomes CEO of Debenhams, given that Sports Direct owns our direct competitor, House of Fraser". 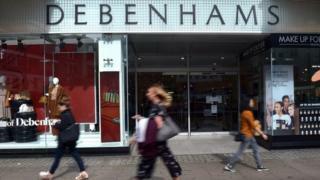 Debenhams said its appeal to lenders "would allow the company to enter into new money facilities and give Debenhams the ability to pursue restructuring options to secure the future of the business". But it also warned: "Certain of these options - if they materialise - would result in no equity value for the company's current shareholders." Debenhams gave no further details. However, one such option is a so-called "pre-pack" administration - an insolvency procedure in which a firm arranges to sell its assets to a buyer before appointing administrators to facilitate the sale. Patrick O'Brien, UK retail research director at GlobalData, said a pre-pack administration was now in prospect. He added: "Mike Ashley's attempt to create a 'House of Debenhams' looks doomed to be an expensive failure after Debenhams revealed its restructuring plans. "It looks likely that creditors will approve plans to take control of the company in return for £200m of additional financing, wiping out Sports Direct's near 30% equity stake and all other shareholders." He said landlords would also lose out, as Debenhams would then be able to exit or renegotiate leases on its stores.